Small/Medium - $399.99 Only 3 left! Large/X-Large - $399.99 Only 5 left! Satin sash measures approx. 36" x 16"
Some people think that having tea parties while wearing flamboyant hats makes one mad. Some people think that it's inappropriate to invite the March Hare to their party. Some people don't appreciate a good riddle or two while they drink beverages! We think THOSE people are pretty mad. There's nothing more fun that having an unbirthday party while inviting your favorite friends. 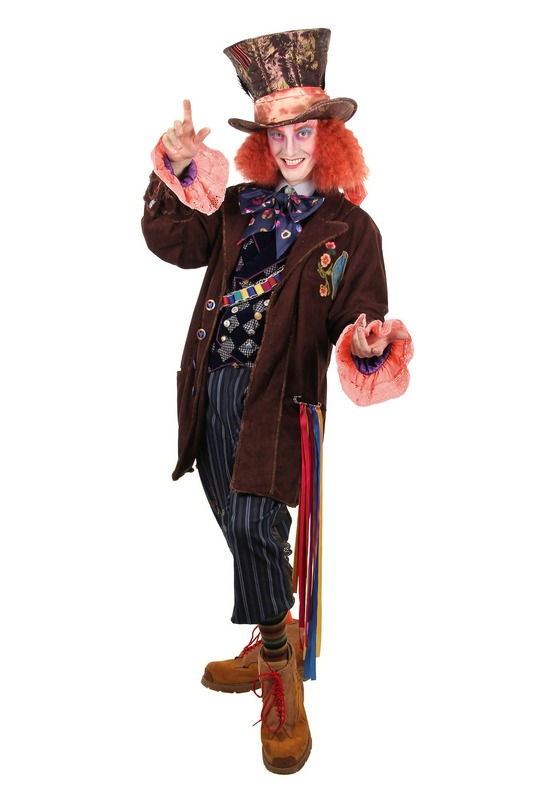 Of course, in Through the Looking Glass, the Mad Hatter has little time to devote to tea parties with his friends. You may just have to take his place! This Alice in Wonderland Authentic Mad Hatter Costume perfectly recreates the outfit worn by Johnny Depp in the film. From the embroidery and unique buttons on the jacket to the frilly cuffs, this outfit just seems to shout “Tarrant Hightopp.” Once you've changed into this costume, you may just feel like trying to steal the Chronosphere from that dastardly villain, Time!